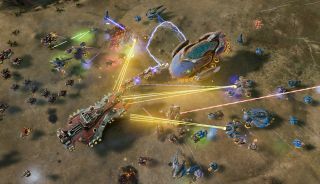 The big hook in Stardock's upcoming Ashes of the Singularity is that it can simulate and display battles involving literally thousands of units on the screen at a single time. It does this through DirectX 12 support, a native 64-bit game engine, and other such techno-magery that mostly goes over my head; the important thing, as the good folks at Maximum PC explain, is that if you've got the rig for it, it (mostly) works. Of course, they're interested in the technology, whereas around these parts, the game is the thing. Which is why you heard it here first: Ashes of the Singularity will go into full launch on March 31. "We are not looking to reinvent the RTS," Wardell said. "Our goal is to introduce a new generation of gamers to the general awesomeness of real time strategy gaming. That means showing how well non-cheating computer players can perform in single player as well as making it easy to get multiplayer games going." Ahead of the March 31 launch date, Ashes of the Singularity remains available on Steam in Early Access.